Scot Bennett Engineering has established a wide and varied customer base by concentrating on providing quality products at the right price at the right time. The quality benchmark BS EN ISO 9002 certification was achieved by the company in 1995, and since has continually revised and improved its quality procedures to reflect the exacting standards of today's market place. ISO 9001:2000 certification was achieved in July 2003, and in 2009 ISO 9001:2008 was awarded to the company. We achieved the latest Quality Standard ISO 9001:2015 for CNC Precision Machining in 2018. From the purchase of raw materials from a selective and approved supplier base, to identification throughout the manufacturing process including finishing processes, to final inspection and customer approval, Scot Bennett Engineering will endeavour to meet the highest standards possible to meet customer requirements. These are selected from a wide and varied supplier base who meet the company's demanding standards. Batch quantities are monitored throughout the manufacturing process to ensure the highest standards of quality are maintained, and where problems occur these are quickly identified and segregated. Measuring equipment is calibrated to exacting standards thus enabling accurate component inspection. 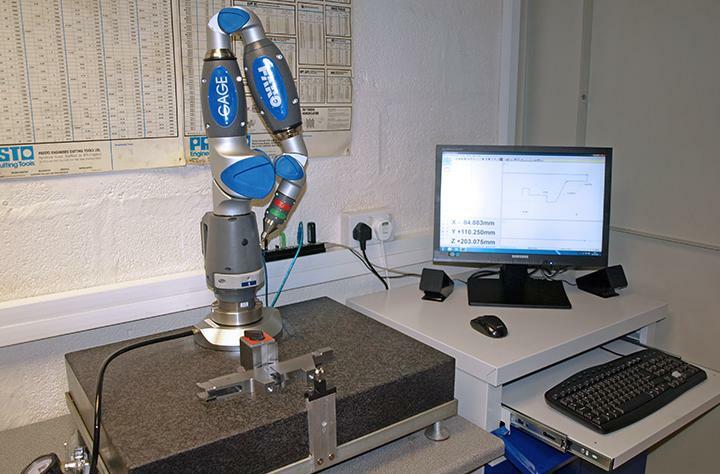 With the recent purchase of the FARO CMM Arm (right), we have the ability to improve measurement consistency, generate automatic reports, and reduce inspection times with the FARO Gauge. This also allows us to measure components whilst still in the machine tool to confirm accuracy prior to production runs. Zinc, Nickel, Chrome plating, Hard anodising, Natural anodising, Stove enamelling, Painting, Chemical blacking, Heat treatments and hardening, Grinding and Honing. Inspection equipment is routinely calibrated to ensure accurate measurement of components. PC based SPC measuring equipment is employed to forecast the reliability of machines, tools and tool life. Surface testing can be supplied with hard copy results and graphical analysis if required.